It's been so hot lately that I try to cook at least one meal a week in my slow cooker. We made this pasta sauce last weekend and it was fantastic! I love pesto, but I prefer it not to be the main ingredient of the recipe. This pasta sauce has the pesto in the red sauce. The pesto gives the sauce a wonderful flavor without being overwhelming. This recipe makes a ton of sauce. We had it for leftovers, and it was actually even better than it was the first night. The sauce also freezes well. We served this over refrigerated linguine pasta, but any pasta will work just fine. Top the sauce with a little parmesan cheese and you have an easy and wonderful Italian meal. Cook Italian sausage in large skillet until browned. Drain fat and transfer to 6-quart slow cooker. Stir in all remaining ingredients, mix well. Cover and cook on low for 8 hours. Serve with your favorite pasta. I like this idea Steph and I'm sure it is delicious. Bev just made some basic tomato sauce (today's post) without herbage and we have pesto ice cubes (and Italian sausage) in the freezer that we just have to toss in. I'm at a campground in N. Georgia now but will give it a try when we get home. 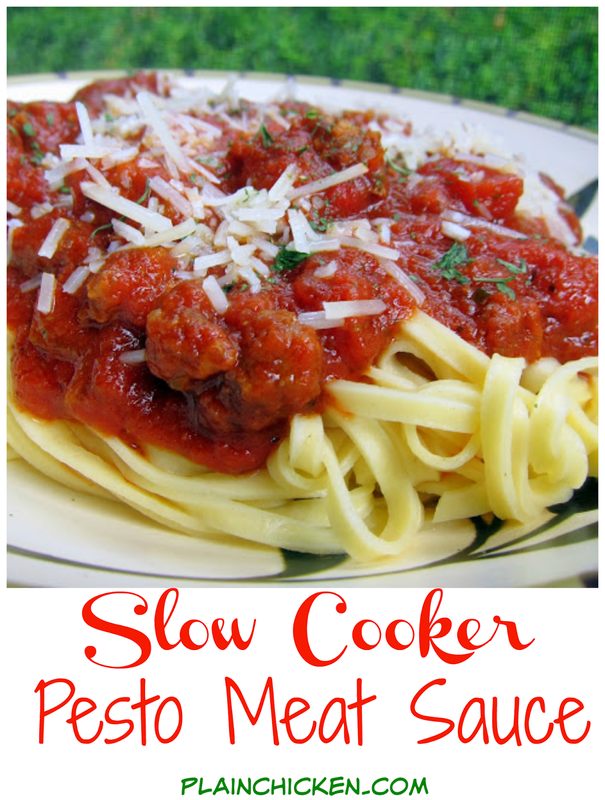 I'm sure that slow cooker really melds the flavors together. WOW! This sounds awesome! I've never tried mixing pesto into tomato sauce. I agree about the heat -- it's currently 110 here. Disgusting. Crockpot meals are DEFINITELY a good idea!! Lindsey - you can absolutely use hamburger meat. Hope you enjoy it! I'm not familiar with San Marzano tomatoes; I don't recall seeing them in my local Kroger. What can you substitute for that?